So this is what I've been hiding from you. Last week, Alison and I went to the far-away yarn shop and I (desperate for a project amidst my stress), picked up this pattern. I figured it was a good pattern to have around, and I decided that I would make it for Jason's nephew Henry and that it would be this year's first Christmas project. I used Debbie Bliss' wool cotton in Ultramarine, and when the sweater was done I had some yarn left... so, I started my first-ever sock! I used this pattern (changed it a bit, of course) and it was pretty straight-forward. It turned out a bit big, but I'm hoping that Henry can wear them as "shoes" over smaller socks this winter. 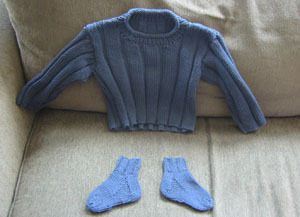 I'm off to knit that lonely sock's partner! Seriously, people have GOT to stop having babies. 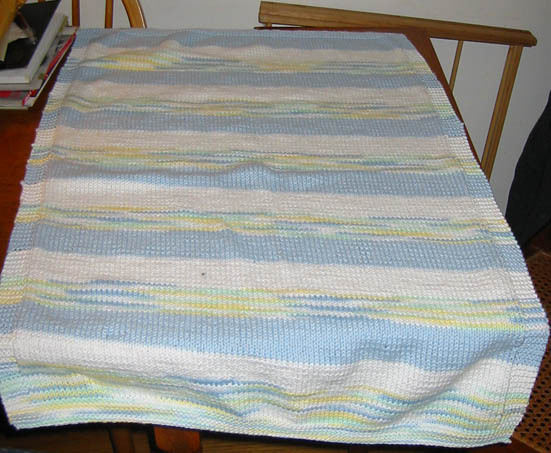 After completing this blanket for the Seattle baby, and this blanket for my friend Dana's baby (who was born on Monday!) I started Peaches for Jason's sister's shower. This pattern knits up really fast, so about halfway through it I figured I could do a second one in time for the baby shower. 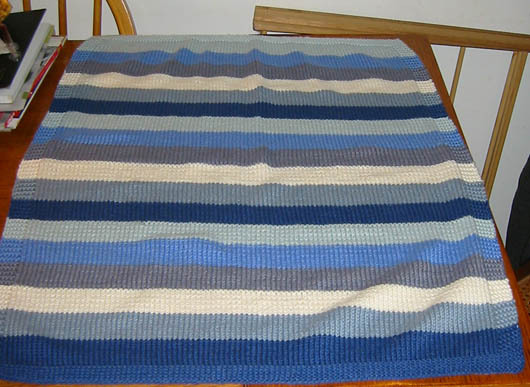 I used Bernat's LoveBug for this blanket, and stuck to just three different colored stripes (Glowworm White, Beetle Blue and Butterfly Ombre). 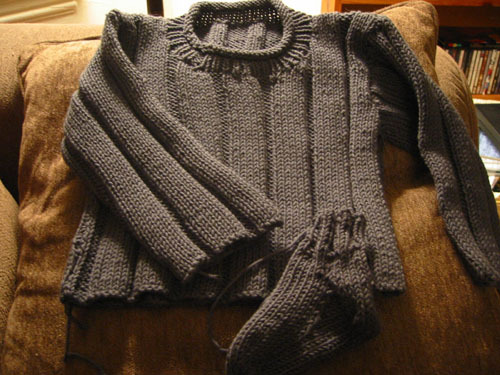 Also, instead of stopping when the pattern said to stop I kept going until I ran out of yarn. It made for a longer blanket, obviously. By this point it should be pretty clear that I was delusional. 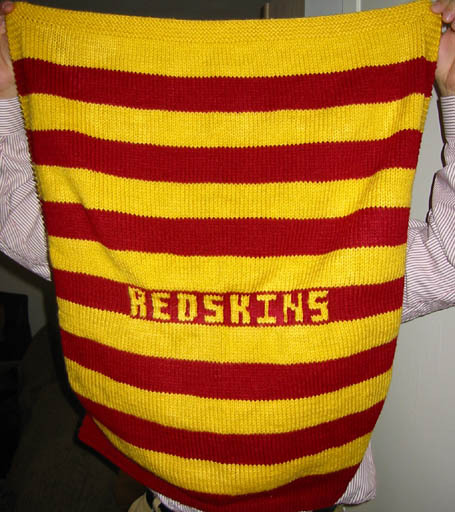 And if it isn't clear, let this final twist make it so: About a third of the way through the Redskins' blanket, I decided that I could knit the word "Redskins" into one of the stripes. Never mind that I have no pattern and have never done anything like this before. I used Excel to devise a pattern, and after one false start, it worked. I was a little overexuberant with my tension though, and as a result there are some puckered spots around the lettering. No matter, it was still a big hit! *I paid for my overzealousness, too. Only one of the blankets was knit and finished in time for the shower. The Redskins' blanket was knit, but not finished and the LoveBug blanket was still on the needles. They are finished and in R.'s hands now, though, and she's still got 6 weeks before baby comes so I think it worked out ok!